This cottage is the former house of the abbot of estate 'Heerlijkheid Mariënwaerdt' in the Betuwe area. 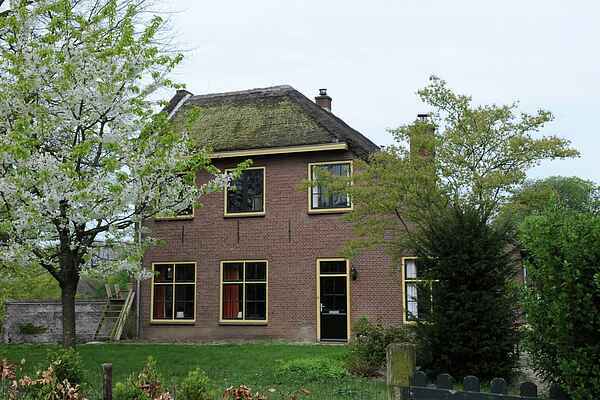 This cottage is also know as the farm house of aunt Janny of the Dutch television series 'Dokter Tinus'. In 2013, this house is completely restored with oak floors, central heating, modern bathrooms and kitchen. Around the house is a lovely garden. You have a beautiful view over the estate and from the front door you can walk into the lanes for a wonderful walk. Estate 'Heerlijkheid Mariënwaerdt' is a vast family estate in the Betuwe, located in the basin of the river Linge. In this oasis of tranquility is pleasant. On the vast green fields is a great sense silence. Here still live deer, pheasants and hares. Mariënwaerdt of all seasons home. In the spring, the region can enjoy the blossom splendor, "summer is swim in the Linge and in autumn you nuts pick among the many walnut trees around the property counts. The estate has beautiful hiking and cycling trails with breathtaking views. 'Buitenlevenhuisje' on the Belvilla website is also located at estate 'Heerlijkheid Mariënwaerdt'.